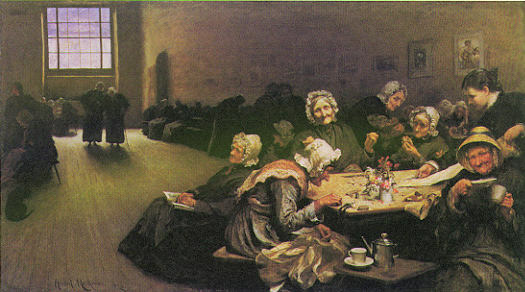 In 1877, the aged women's ward at Westminster Union was the subject of an illustration by Hubert (von) Herkomer entitled Old Age — A Study at the Westminster Union which appeared in the weekly magazine The Graphic. The following year, Herkomer rendered the same scene as an oil painting retitled as Eventide. In Eventide the workhouse appears as a comfortable and sociable environment, despite the poverty. The painting received admiration when it was exhibited in the Paris Salon of 1879. Its distorted perspective with the pressing foreground cluster of figures was considered extremely innovative and powerful while the natural expression of the elderly women was equally praised.